Being a travel agent and having worked in this business for 20 years enabled us to take many fabulous vacations all over the world…however I must say I entered this vacation with more than a bit of trepidation…let’s see. This vacation had everything we needed we were able to fulfill our passion of riding a great bike in an exotic location through winding mountain roads as well as along turquoise beaches. 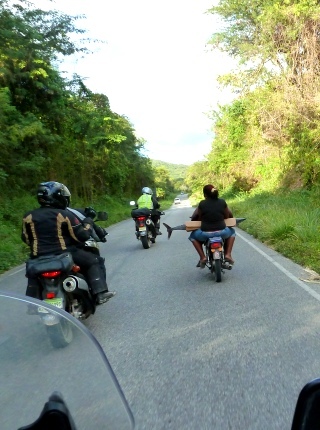 The MotoCaribe team are the best and we would highly recommend this to anyone wanting a truly unique experience…it is not for the faint of heart but what is better than an adventure awaiting you at every turn. The MotoCaribe Alumni East Tour is the newest tour on our schedule and is destined to become one of the most popular tours anywhere! 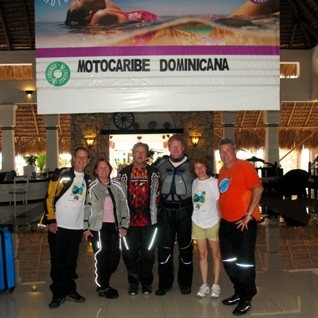 It is targeted to MotoCaribe Alumni who are already familiar with the riding culture of the Dominican Republic. This tour starts in the tropical mountain town of Jarabacoa (“ha dah bah COH ah”), spends a day touring the central mountains and heads east through the center of the country through beautiful rural farm land growing rice, platanos and pineapple. After passing many of the Dominican Major League Baseball academies we spend the evening at a beachside resort on the Caribbean Sea. Next day we ride north, and after a tour of an organic cocao (baby chocolate) plantation & processor, continue to a hidden jewel of a resort on Samana Bay and spend the next day exploring Los Haitises National Park by boat. We ride east through undeveloped areas to Miches through the incredible beaches on the East, a stop at Playa Macao, and then the long day ends at our beachside resort. We explore an island by boat and Altos de Chavon by foot before we head west for cave exploration and more beaches. What makes this tour special is a ride through Santa Domingo with a stop at the Tres Ojos caves and Faro a Colon, the tomb of Christopher Colombus. We spend the night in a boutique hotel in the 500+ year old Colonial Zone and dine in a gourmet restaurant in Plaza Espana. The next morning we walking through this historic district. We head back to Jarabacoa through rolling hills and ride the epic Constanza-El Rio mountain roads back to Jarabacoa. The East tour travels through three of the country’s four distinct climate zones. The towns of Jarabacoa, Manabao, La Vega, Cotui, Monte Plata, Bayaguana, Bayacanes, Santo Domingo, Hato Mayor, Sabana de la Mar, Miches, Punta Cana, Bayahibe, La Romana, Bonao and Constanza. And, of course, epic motorcycling. 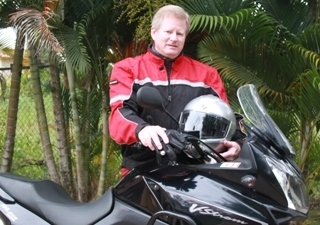 Enjoy a virtual ride on the MotoCaribe East Tour from arrival to departure. The Alumni East Tour is offered once this year in 9-day tour. The Alumni East Tour is on 99% paved roads. These tours are in both the “tropical” and semi-arid zones of the Dominican Republic. The Alumni East Tour is approx. 1600km. 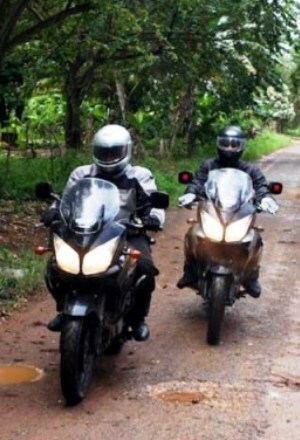 All MotoCaribe Tours are excellent for 2-up touring. Sent to you FREE by e-mail!